Several years ago, in another thread I predicted this site would go highrise...and it is! 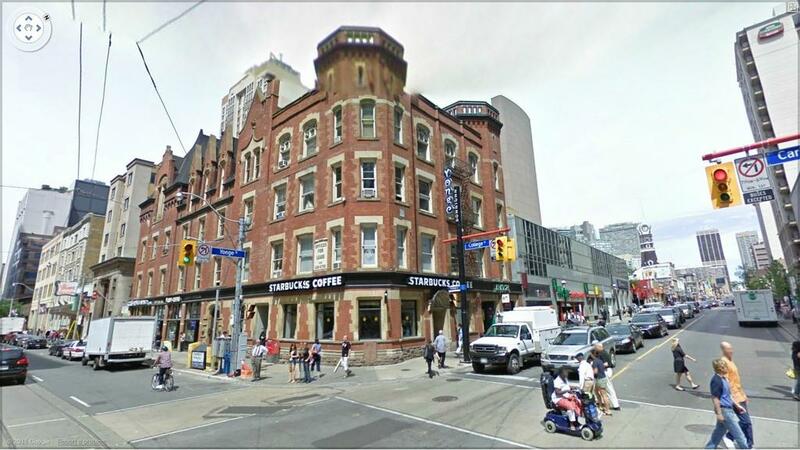 Streetview of corner of Grenville and Yonge Street. 21 Grenville by Centrecourt your views are gonna be blocked! I predict a monster here, perhaps even two towers. Knew it would only be a matter of time before someone bought that site. Now we can begin to envision what might get proposed! But Sizzlers burgers taste so goooooooooooood. If a major development goes in here, the proposal for 501 Yonge won't look at all out of place. Subway connection and College-Park PATH link please! There are no world class cities, only world class people. Yep, minimum 55s, 65-70 possible. Don't think there's enough room for more than one tower. Don't think there'll be a PATH or subway connection since either would probably have to go beneath the building with the Starbucks. They could run the connection under the laneway instead of going under Oddfellows' Hall. I don't know about a massive building tho, maybe 40-50 storeys would be reasonable. This is going to be right on Yonge, not set back on a sidestreet. Of course not...Odd Fellows Hall is untouchable. Maybe I'll get blasted for this but I've always thought Oddfellows Hall would make a great base for a condo if they used the same type of brick and style for the rest of the new building. Actually a hotel/condo would work pretty well right here. Oddfellows is untouchable. Until I looked at this picture though, it hadn't quite occurred to me how egregiously crappy the rest of the block is. Oddfellows is an example of a building that must be saved. Does anyone know if it is on the "Historical Buildings" list? I'm sure this buiding isn't part of the development - at least I hope not. If my math is correct, 460 Yonge is only 19,000 square feet. less than half an acre. so, a quick calculation at 20 times coverage would net about 38 storys (10,000 sq ft floorplate - 19,000 sq ft floor plate would of course mean 20 floors). Maybe it is part of an assembly? or maybe its to be an office tower in which case maybe 38 floors is enough? FYI - Oddfellows site is only 7,600 sq ft and while a likely candidate for an assembly, doesn't add all that much to the scale of things - unless you want PATH access? - I wonder.